Since my last post about our garden, a lot of things have been done. Finally the diggers left, after some substantial landscaping and in the meanwhile the first plants went in as well. I’ll tell you more about that in another post, but now I’ll focus on the just finished natural swimming pond (well, almost finished ). 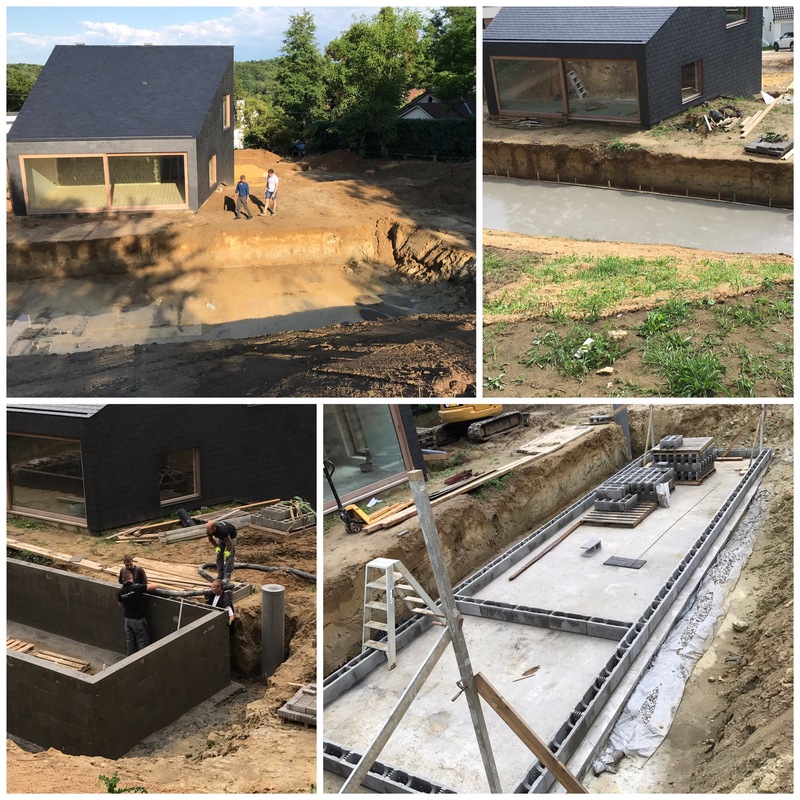 At first we wanted to do this project in a few years, but that would mean destroying half of the garden again to let them do the works, so we decided to do it at the same time with the built of our house. Why a natural swimming pond ? Well a natural swimming pond has quite some advantages. First of all you don’t need to use the not so healthy chlorine to keep the water clean. Lava stones and water plants do the work instead. It attracts wildlife to the garden and adds that way to the ecological balance of your garden. You can have it in all shapes and forms. In winter you can still enjoy the view of the pond, without having to cover it. Because our garden is on quite a steep slope we didn’t had so much choice of where to put it. Local regulations also only allow a pool or pond when it’s behind your house to be built without a building permit. So behind the house it is. The same topographical limitations on our plot made us choose for a straight and less natural form. The idea is to really use it to swim laps, so the long narrow shape was quite perfect for that. So how did they built it ? We asked our building contractor to dig out the hole where the pond would come. 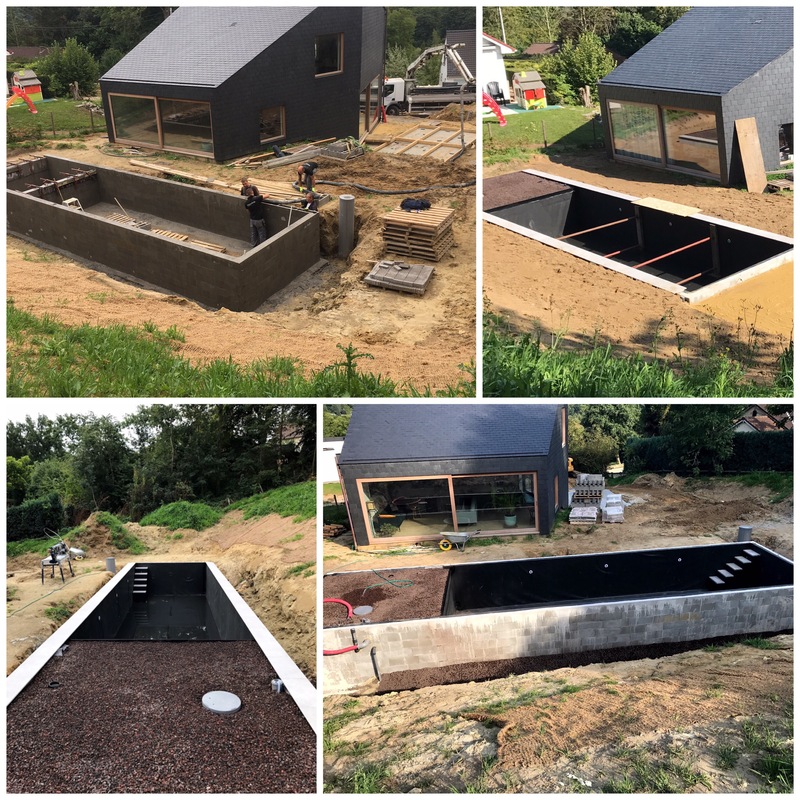 When that was done the people, specialized in natural swimming ponds came in. The structure, in our case, is almost the same as normal pool. They pour a concrete slab, build the walls of the perimeter in concrete hollow blocks together with some steel rods and pour them full with concrete again. That’s the simple base and may indeed not sound so ecological. The filterzone in our case takes a bit more than 1/4th of the total pool. After installing the pump zone, connecting pipes and electricity they cover the whole pool with a rubber liner. The filterzone gets filled with lava stone and the border stones go up. At the end you fill it with water, the plants go in and the pumps start doing their work. The system we have uses two pumps : one to pump the water through the filterzone and one to bring in extra oxygen. As it is not really the weather for it we didn’t try it out yet, but it seems the birds like it a lot. Also the first frog found its way to the brand new pond and I am sure more will follow. Can’t wait for spring to start making use of it. That is really impressive Stefan, such a great idea. I look forward to hearing and seeing how it gets colonized. I also look forward to hearing some funny stories of swimming among the frogs and toads! You have a beautiful house and garden. Looks fantastic! You’re going to have many hours of enjoyment swimming in it and just admiring the view. Do share more images when the plants have filled in. Wow zeg, volgende zomer tussen de kikkers zwemmen! What an incredible project. We’ve been seeing a lot about natural pools recently, and we even had a short introduction to the topic for our readers http://www.kraftykoi.co.uk/blog/new-kind-swimming-pool/. It’s a topic that many people haven’t come across before. May have to point people towards your post in future for a real-life example. You must be very pleased with the result! Just read you article… wow, prices for a swimming pond are crazy in the UK ! Indeed they can be! Space is an issue too for almost everyone. You see natural pools crop up in the national press quite often, I guess because they’re interesting and aspirational 🙂 Hope you don’t have to wait too long for your first dip! Prachtig, een droomhuis met droommannen. Proficiat! What a story. You have a fine home and the best of swimming pools.